This is a place for me ( rei ), the head developer of ACDB to write unfiltered about what goes on behind the scenes at ACDB. Although, all members can write and post their own news. My posts though, will always be highly technical and mostly incomprehensible to all but the most esoteric of nerds. 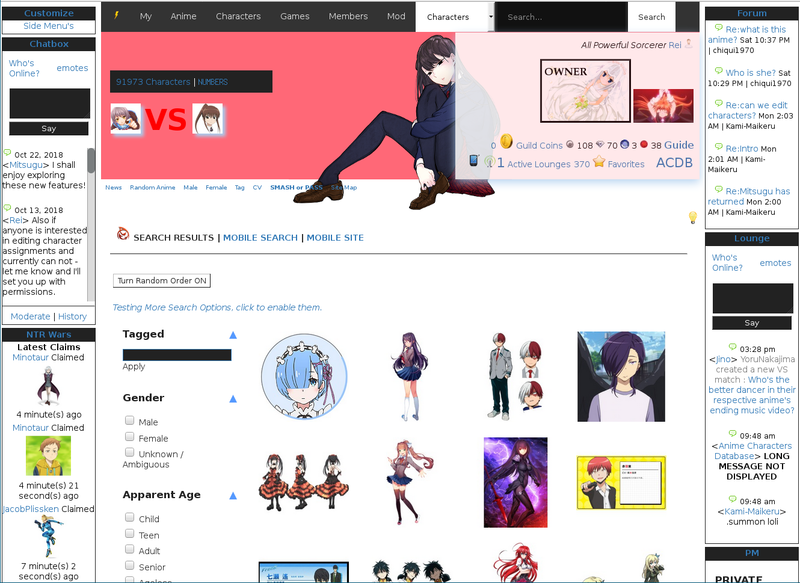 All members are invited to use this feature to share interesting news related to anime. Whether it's a new episode, a new series, an anime conference, Golden Week delaying our favorite shows, or something cool you came across. You can now post it here. And easily Edit or Delete your post. Moderators will keep an eye out for spam. Made a slight improvement to the character name search, such that if no results are found on the first pass when searching two names, it will reattempt the search after swapping the order of the names. Before, a search for Izumi Konata would have returned no results. Having learned from last time, this time I am making Side Menu's available as an OPT-IN feature. You can find the toggle in the footer of the site, to the far left. Click it once, and the sides will be enabled. Click it again to make them go away. Or visit this page to turn just one off.